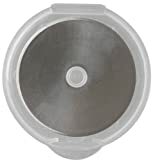 Interested in the Fiskars 95287097J Rotary Cutter Replacement Blades, 45mm , 5 Pack? Is the price too high? You can easily price watch this product and we'll notify you when the price reaches your target.